For the recently released Anthem, developer BioWare brought CVD VFX on board to help with a range of cinematics in the game, a project that would see the Vancouver studio spend several months collaborating with the developer’s creative team on a unique process of enhancing game footage renders and generating bespoke imagery. In the world of video games, cinematics and cutscenes play a crucial role; they can help to flesh out the story, propel players along into the next gameplay segment and provide emotional connections to other parts of the game. 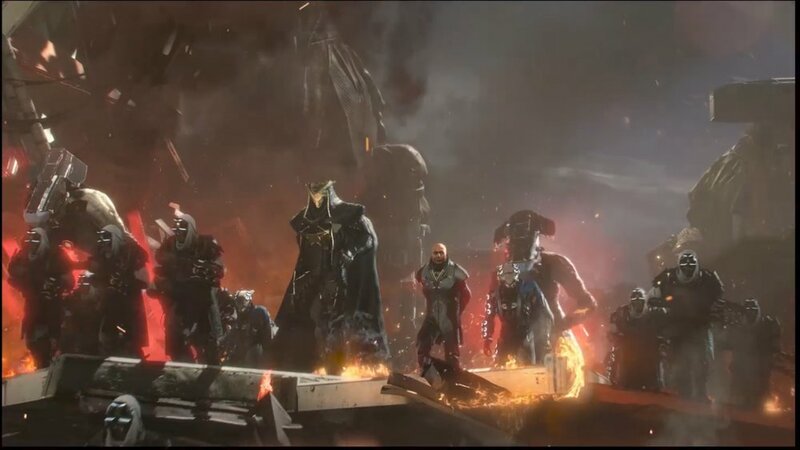 For the recently released Anthem, developer BioWare brought CVD VFX on board to help with a range of cinematics in the game, a project that would see the Vancouver studio spend several months collaborating with the developer’s creative team on a unique process of enhancing game footage renders and generating bespoke imagery. Here’s how they did it. One of the drawcards of Anthem is its combination of third-person shooter and action role-playing game elements, as players - taking the role of ‘Freelancers’ - enter conflict with the ‘Dominion’ on an unnamed alien planet. Those plot points were things CVD VFX had to keep in mind when it was asked by BioWare to contribute to cinematics for a backstory and battle of the destroyed city-state Freemark. For that, they would take original Frostbite game engine renders of cutscenes and add layers of extra effects and enhancements to them. The studio was also tasked with “exploring ideas on how we launch from the Fortress of Dawn to the Trial of Might,” says CVD founder Chris Van Dyck. “It was about working out how we do that in an organic, intense way.” This second request led to the creation of a ‘boot-up’ sequence found in Part 7 of the game - The Javelin of Dawn. 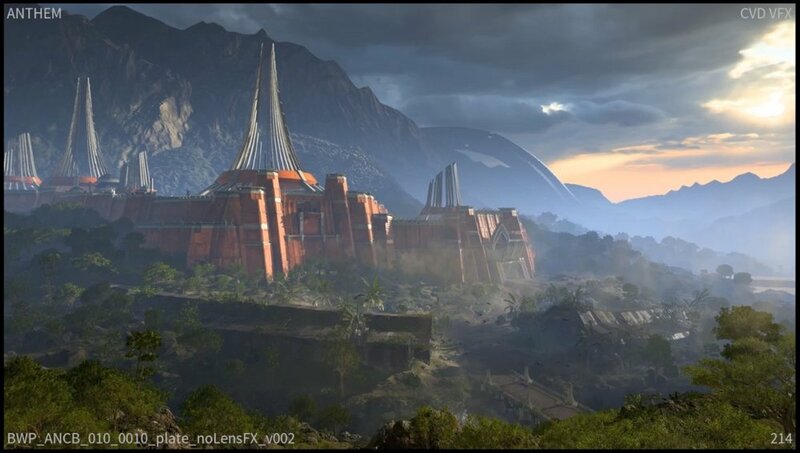 That’s a wrap-up echoed by John Mayhew, BioWare’s development director of external art, who also notes that the game maker went to CVD VFX for their expertise in environment visual effects with the aim to add a sense of scale to the cinematics. Sometimes that kind of epic grandness to the environment is frankly just really hard to get in real-time because of how large of a space you're having to have running all at once. So, we were able to, on CVD’s strength with digital production mattes and backgrounds, make sure that we were getting that depth, and we were getting the detail where needed. With the brief settled, how did CVD VFX actually pull off that work? Sequence lead Mike Wearing says that several artistic and technical methodologies were undertaken, and, surprisingly, it was not dissimilar to the process of live-action visual effects and compositing that CVD is so familiar with. For most shots, CVD VFX would receive at least two ‘plates’ that were Frostbite renders, one with game engine lens effects and one without, although sometimes there were more plates that could then be blended together. An interesting challenge came from the fact that, since certain elements in the rendered plates - such as explosions, impacts, muzzle flashes and shockwaves - were dynamically generated in the game engine, their timings and positions would change slightly in each render. To deal with that, CVD VFX built setups that could be quickly re-worked as necessary if a new plate was received. “We needed to enhance the look while not deviating too far from the original flavour of the game engine elements,” notes Wearing. One of the most complex sequences saw the destruction and subsequent fall of the ‘Strider’ that rams through the walls of the city of Freemark. “This sequence was the real hero of that cinematic and required all our bells and whistles,” says Richmond. Another scene that ‘shone’ thanks to extra enhancements from CVD was, according to BioWare, one that sees a close-up of Dominion leader Doctor Harken surveying the damage his side has wreaked upon Freemark.